How to create custom forms in WordPress without using plugins? 10 Comments on How to create custom forms in WordPress without using plugins? Forms are an integral part of a website. While there are lots of wordpress plugins available to create custom forms, most of them are not up to the task. It is very easy to create a form in WordPress, provided you have a fair knowledge of php, html and js. Let me show you how it’s done. > Create a new page. > Go to HTML mode. > Specify the backend php script in the action attribute of the form tag. Include as many form fields as you wish. Specify the method of form submission as post. Bravo! You have successfully completed the front end of the custom form. > Create a new PHP file in your favourite text editor. Now you have successfully created your php script which will be called in the action attribute. Upload this php file inside the wordpress directory. NOTE: In the form action, I have used “../process.php” because the php file is one level above the page which contains the form. Create a new page with a form successful submission message. Make sure the URL of this page is the one which is specified in the header() of the php script. That is it! You have successfully created a custom form and connected it with a database! How to remove facebook timeline? 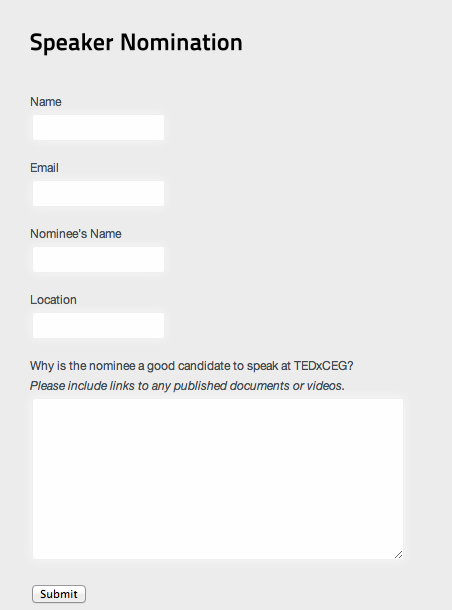 Joe – did you figure out how to pass your vars to the thank you page ? That’s something I’m struggling with also. I can obviously echo them (with HTML tags around them) within the form handler but then I have to somehow make the form handler display a properly formatted page. Not having any luck with that. Any tips would be appreciated ! One possible solution which I could think of is this: You can POST the variables in header and get them on your thank you page. Of course, WP doesn’t allow you to execute PHP in those pages. So you can either create a custom page template (recommended) or install any one of the plugins which enables PHP in WP pages. I have not tried this but I suppose you can pass the variables using POST method. The urlencode() function takes care of any reserved characters in the url. #2) I created another template with a form handler in it to validate all of the $_POST variables — and then display both errors and the form if corrections were needed, or a “Thankyou” if they were not needed. I created a WordPress page using this template (this page uses itself for the form’s “action”). However, when I hit submit (on the page discussed in #1), my debugging echos (from the handler in page #2) show me that none of the $_POST variables are set in the handler. So apparently they are not passed from one WordPress page (#1) to the other (#2). I think you are suggesting that I bypass the standard form “Submit” and send all of the $_POST variables using the header function. I’ll try that next ! Thanks again. @feralreason: First of all, why do you say you don’t have room for JS error message? You can just display an error alert box right? Thank you for these instructions. I have existing HTML forms that I want to use “as is” on a WP static site, and this was just the ticket. I don’t want to put my form results into the database, though; I want to send them in an e-mail. Is there anything special I need to do to work with e-mailing results out of WP vs. e-mailing them on a regular HTML/CSS site? This is great, thank you so much for posting it.